1. Evaluation is to be done as per instructions provided in the Marking Scheme. It should not be done according to one’s own interpretation or any other consideration. Marking Scheme should be strictly adhered to and religiously followed. 2. The Head- Examiner has to go through the first five answer scripts evaluated by each evaluator to ensure that evaluation has been carried out as per the instructions given in the Marking Scheme. The remaining answer scripts meant for evaluation shall be given only after ensuring that there is no significant variation in the marking of individual evaluators. 3. If a question has parts, please award marks on the right hand side for each part. Marks awarded for different parts of the question should then be totalled up and written in the left hand margin and encircled. 4. If a question does not have any parts, marks must be awarded in the left hand margin and encircled. 5. If a student has attempted an extra question, answer of the question deserving more marks should be retained and other answer scored out. 6. No marks to be deducted for the cumulative effect of an error. It should be penalized only once. 7. 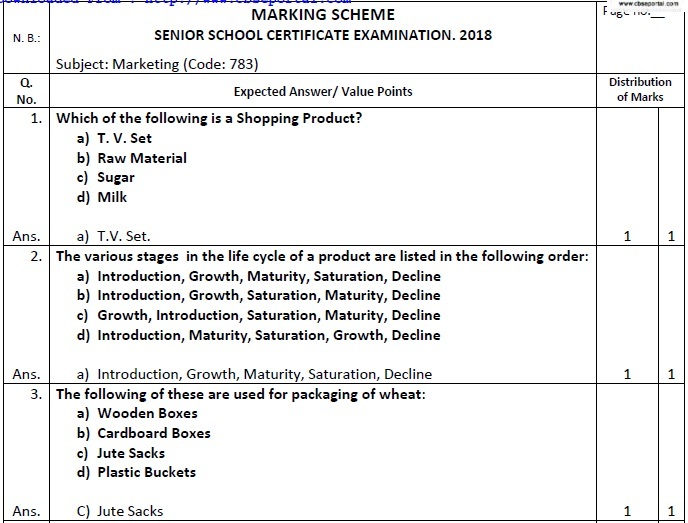 A full scale of marks 1-60 has to be used. Please do not hesitate to award full marks if the answer deserves it. 8. Every Examiner should stay up to sufficiently reasonable time normally 8 hours every day and evaluate 25-30 answer books. Leaving answer or part thereof unassessed in an answer scripts. Giving more marks for an answer than assigned to it or deviation from the marking scheme. Wrong transference of marks from the inside pages of the answer book to the title page. Wrong question wise totaling on the title page. Wrong totaling of marks of the two columns on the title page. Marks in words and figures not tallying. Wrong transference of marks from the answer book to award list. Answers marked as correct but marks not awarded. Half or a part of answer marked correct and the rest as wrong but no marks awarded. 10. While evaluating the answer scripts if the answer is found to be totally incorrect, it should be marked as (X) and awarded zero (0) Marks. 11. Any unassessed portion, non- carrying over of marks to the title page or totaling error detected by the candidate shall damage the prestige of all the personnel engaged in the evaluation work as also of the Board. Hence in order to uphold the prestige of all concerned, It is again reiterated that the instructions be followed meticulously and judiciously. 12. The Examiners should acquaint themselves with the guidelines given in the Guidelines for spot Evaluation before starting the actual evaluation. 13. Every Examiner shall also ensure that all the answers are evaluated, marks carried over to the title page, correctly totalled and written in figures and words. 14. As per orders of the Hon’ble Supreme Court, the candidates would now be permitted to obtain photocopy of the Answer Book on request on payment of the prescribed fee. All examiners/ Head Examiners are once again reminded that they must ensure that evaluation is carried out strictly as per value points for each answer as given in the Marking Scheme.